The Disassembly Window shows the program execution in assembly code, or, intermixed with the source code (device dependent). When the Disassembly Window is the active window, then all debug-stepping commands work on assembly level. Open the window with the menu View — Disassembly Window. 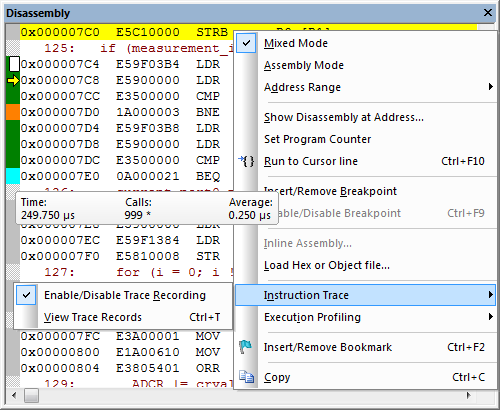 Enable the trace history with View - Trace - Enable Trace Recording. Use the Context Menu to access commands or set options quickly. Set Breakpoints by clicking into the left (colored) margin. No Code - Lines with no code are marked with a light gray block. Unexecuted Code - Unexecuted lines (instructions) are marked with a dark gray block. Executed Code - Fully-executed lines (instructions) are marked with a green block. A green block on a branch instruction indicates that both the true and false conditions have been tested. Branch Condition True - A cyan (blue) block indicates that only this condition of a branch was true and therefore always taken. Branch Condition False - An orange block indicates that this condition of a branch was never true and therefore never taken. Change the background color for the current line (yellow in the picture) with the dialog Edit - Configuration - Colors & Fonts - Disassembly Window - focus line background. For further statistics refer to Code Coverage, Execution Profiler, and Performance Analyzer.